It is a myth that goldfish will not grow past the capacity of their containers. If kept in a small container/bowl their growth will be slow and stunted but they will grow (and likely eventually die prematurely due to poor environmental conditions). Goldfish are very messy (and foul the water quickly). Ideally, you should have at least 10g for every Goldfish. Avoid using spray or aerosol cleaners near the aquarium (these can poison the fish). Water changes should be at least 20% once a week in a well filtered system (up to 90%/week if in a "bowl" or other vessel with no filter). When acclimating fish, do watch/test for differences in the pH of the water from which it is coming and the water into which it is going. In systems that are too small, lack of dissolved oxygen can cause illness. Adding an airstone can temporarily help the problem, but is not a long-term solution. 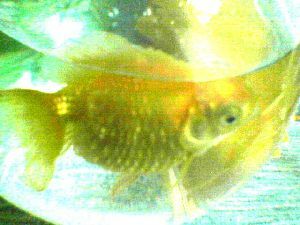 Some crew members suggest using "freshwater" aquarium salt with suffering goldfish (at least one crew member disagrees). pH swings are much more dangerous/harmful than an "imperfect" but stable pH. pH swings can cause excess slime coat and white patches on the body of the fish. Some of these points, stated in context and elaborated on below, are highlighted in blue to make them easier to find. Sick goldfish II Hi -- Hopefully you received the e-mail we sent yesterday about the goldfish we just finished treating for what we thought was ich, and we were wondering if one of the fish now has a secondary infection. After more research and symptoms appearing (the sick fish is now spending most of its time on the bottom of the tank, breathing hard, clamped fins; and -- visible only when he's facing away and the light is on -- we can now see white/bluish velvety patches on his body) we think he has Chilodonella. We ended up tearing down the tank yesterday for a nearly complete water change, we added about a gallon of the old water back in (don't know if the tear-down was a smart thing to do or not since ammonia & Ph are up now -- ammonia, .5 and Ph, 8) but it seemed like we'd been adding so much "stuff" to the water maybe a complete change would help & maybe we'd get rid of some of the parasites in tank. Anyway, after getting started again, we began treating with Nox Ich (malachite green & sodium chloride) late last night. No improvement noticed yet this morning. Would a malachite/Formalin combo be better? < The combo you suggested has been by far the most effective for me. I personally use Rid-ich by Kordon. I noticed that it does affect the biological filtration so I always quarantine new fish before I add them to my main tank. It is easier to treat and cheaper too.> Does the diagnosis sound correct? < You have so much going on it is hard to be precise. First of all lets get the water right. Start at the beginning by servicing your filter. Keep cleaning it weekly even if it looks like it doesn't need it. Don't add any carbon yet because that will remove all your medication. If your fish is not eating then don't feed them until they are up and about. Ich takes about three days to cure in a tropical tank so may take as long as a week in a cool water tank. Control the ammonia with water changes for now but use a water conditioner that adds a protective slime on the fish too. In a week I would vacuum the gravel to remove any sludge that may have built up in case in did not get down with the near tear down. Some rock salt could be added to the water too. This would also increase the protective slime coat on the fish.> Should we do anything other than water changes to correct ammonia/Ph? (we did add a 1/4 dosage of a Ph balancer this a.m. -- didn't want it to correct too quickly). < Just do the water changes for now and monitor the ammonia and don't worry about any pH adjustments for now.> Won't water changes upset concentration of medication? < Many medications break down very quickly in water. But the rid-ich is very effective and the recommendations on the bottle include a water change.> If we do changes, should we add some medication to the newly added water to keep concentration up? < Follow the directions on the bottle until the ich is cured. If there is any secondary infections we will deal with it after the ich is cured and the fish has had a chance to build up some resistance.> So many questions -- aaaaggghhhh! I have searched your site (lots of interesting stuff) and left a posting on the public chat (no response yet). Sorry so long again, but would really appreciate any advice you can offer. < Check some of the FAQs on the site to see if you understand the nitrate chain. Once you understand it it may make you fish keeping experiences a positive one. -Chuck> Thanks.